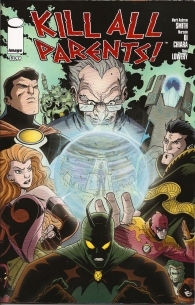 Kill All Parents!, by Mark Andrew Smith, Marcelo Di Chiara, and Russ Lowery, published by Image. I can’t tell if it’s a one-off or not, but this clever satire takes on the “standard superhero backstory #1: dead parents.” Featuring a set of superhero parodies you’ll easily recognize, this issue tackles not just the stereotypical backstory, but also the angst, anger, and anxiety of being a super-orphan. The story itself is a little weak and feels like it was intended to be told in a 4-6 issue series that was then condensed down. But the artwork is very well done, and there are a few clever moments sprinkled throughout the issue. My favorite is the graveyard on Father’s Day, crowded with superheroes paying their respects to their absent dads. The relationship between superheroes and their parents seems to need addressing in every comic series, whether it’s Superman’s adoption story, Batman’s orphaning, or the single parenting in Buffy. Although the superhero genre often reinforces the status quo, I wonder if it also portrays alternative families in a sympathetic way. Or, perhaps, it’s a reflection of the audience’s wishes and makeup. I don’t know, but I did appreciate something poking a little fun and whimsy at the situation, and, even more, the way the superheroes respond to the revelation of the true author of their grief. This entry was posted by Stephanie	on Sunday, August 3rd, 2008 at 7:22 am and is filed under Image, issues. You can follow any responses to this entry through the RSS 2.0 feed. You can skip to the end and leave a response. Pinging is currently not allowed.